Bake My Day! : Oink! We don't eat that! Oink! We don't eat that! Mom! Look what you made! We're not going to eat this one, you'll need to keep it. So that's what I did. For three days. I figured if I took a picture it's a form of "keeping it". 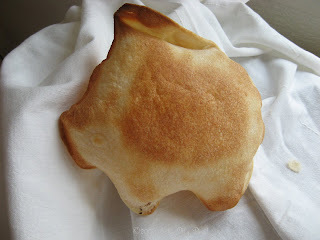 In case you were wondering; it's a variation on pita bread, this one all puffed up to become a piggy bank. oh! I love it! kids have the best ideas! I love baking with them it's always such an exhilarating experience! Crazy kids... ask them to put money in it, that would be good! (hand up) I'll eat it!